We didn’t have the halibut, in keeping with our core belief that seafood in the middle of the desert (and 250 miles away from an ocean) is best consumed at a seafood restaurant, or some other one specializing in fine fish cookery. But the lamb shank was just as good as ECAFS said, and the shrimp cocktail just as atrocious as WKECAFRG found it. Our deviled eggs weren’t spoiled, and because they know us here, our service (from the finely fetching Brittany) was top notch. One thing concerning GMAFSR was, most of the (union) service staff, seemed to have been plopped into the restaurant without proper instruction about the chef or the menu, but we agreed this is a growing pain that can quickly disappear if upper management is doing their jobs. When it comes to the pork loin with flageolet beans, hangar steak with onion carbonara (something GMAFSR found good but gimmicky, coming as it does in a separate vessel), salad nicoise, steak tartare, french fries and rotisserie chicken, the kitchen is doing its job splendidly. The fried chicken and bacon and onion tarte were good, but not as life changing as we expected them to be, but the gougères could keep us at the bar all day long nibbling on them. Big, light, puffy and cheesy, they are worthy of 3 Michelin stars all by themselves. As is the napoleon — a six inch high rectangle of wispy mille-feuille pasty sandwiching almost preternaturally pure pastry crème. Michel Richard has obviously spent some serious time with his cooks showing them his serious pastry chops, and it shows from your first, flaky, fabulous destruction of this impressive composition. The issue, as all three restaurant pros pointed out, isn’t how everything tastes right now, when the place is slowly cranking into gear (and doing a few hundred covers), but rather, how will it maintain quality control when 1,200 diners are passing through its (non-existent) doors, 24 hours a day. All expressed admiration for Richard as one of the few chefs to open fabulous restaurants over thirty years on both coasts, but all wondered if the sheers numbers might overwhelm the pristine nature of his cooking and make this just another casino food factory (and money machine). As soon as you mentioned the staff was unionized you answered your own question- the quality will slide and the waitstaff will remain uniterested and unmotivated. They are not placed in this restaurant based on their skill level and motivation but rather on their house seniority with the union. Alas- another well meaning chef’s restaurant will be reduced to a food factory. Just wait and see- i called it first- res ipso loquitur. You have to have a deathwish to open a restaurant in this economy. and a union staff? talk about starting out with two feet in the grave. stupid unions. if it weren’t for them my kids COULD be working the night shift right now instead of wasting their time in elementary school. what’s with blaming the unions for restaurants failure? having been a chef in a union joint for a long time i can tell you that the unions don’t make the menu, decide on steps of service or make business decisions. it is possible to train a union employee and to fire one that isn’t cutting it, consider that myth busted. ELV, do you have a link to the full menu at Central? I’ve been searching for one online and haven’t found anything. 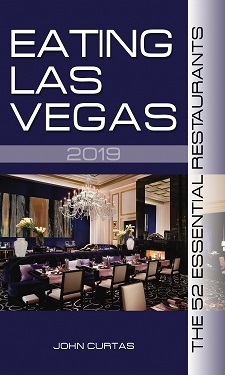 The Central Las Vegas website hasn’t been updated to include the menu. Now as far as the union discussion goes, I can only speak to my personal experience. I’ve worked in a union environment for 24 years, first as a member of the rank and file and for the past 18 years as part of the management team. I currently oversee about 600 union employees in a customer-service industry. No, not waiters and waitresses and those in food service, but it’s still a unionized workforce directly serving customers. This may shock some of you, but the relation between union workers and companies isn’t always adversarial. And don’t always believe that union workers aren’t motivated beyond what the union contract requires them to do. If the relationship between management and the union is one of mutual respect and compromise, it can work both to the benefit of the company and the employees. We can agree to contracts that benefit both sides, and as a result, employees can be inspired to provide exceptional customer service without getting something solid in return other than a thank-you from the customer and company and maybe a $5 Starbuck’s card. That’s just one example, but I see it every day. Whether or not that will be the result at Central only time will tell, but don’t sell anyone (either management or the union), short at this point. is that you Neil Cavuto? or is that some top shelf sarcasm? you have a right to be upset that millions of jobs were shipped overseas, but it wasn’t the unions who got/get incentives for that kind of race to the bottom in searching for countries that can produce for us. why is the extremely pro-union Germany such a powerhouse? was it the UAW who designed/design gas guzzling cars that are two steps backward in what the demand calls for? or for the outrageous price of healthcare? there is a union you should be angry with, it is the union of gigantic insurance companies that have turned your poor health into a for-profit venture. by your Bill O’Reilley logic it is the unions who caused American’s wages to remain stagnant for the last 30 years, while inflation keeps on humming? is it the unions fault you’re over-leveraged and your dollar doesn’t get you as much as it used to? back to the restuarants, no one had a problem with the culinary union while we were in the bubble, celeb chefs were printing money and it all trickled up. now that vegas (and the country, and virtually the entire world) are in a depression it is the union’s doing? again, having run a union restaurant for the better part of 11 years, i can tell you just a few of the benefits: you can hire the best applicants instead of relying solely on (largely) undocumented immigrants. you can hold your staff more accountable because they are well compensated. and when they’ve exhausted their abilities to do the job, you can EASILY fire them and replace them because their are stacks, STACKS of qualified applicants, even in the bubble years it was easier to find skilled cooks/FOH staff in the big hotels while the non-union squabbled for the scraps of workers who can not pass a background or drug test. the downside: our labor costs were higher, and the business was not as profitable as one that pays the bare minimum. we were still very profitable though. on the flip side, restaurants that are non-union have the chance to make more profit by not having as high a labor cost, or contribute to a quality healthcare plan. is the non-union product at Tao or Applebee’s better than the union product at American Fish or Petrossian Bar? as chefs/employers we try to hire the best staff and train them the way we want, but not all staff can perform at the same level, and not all managers/chefs are capable of training anyone to do a job the same way they (we) were doing it (often times as a union employee themselves before promotion). the point remains, however, that of course you’re angry that our local economy is in the pooper, but you are misinformed and your anger is misdirected. this is the free market at work. with the zeal to cut public safety nets, why would you want to cut the private ones as well? lastly, is it the unions fault that Vegas can’t get a real food critic? i love your blog JC but only for it’s entertainment value, the hot hostess watch and your tolerance to adverse comments. The Union staff is not the problem. This place was still hiring less than a week before opening. Union or not, you have to adequately train someone if you want to hold them accountable for service standards. I have worked union and non-union for 15 years, and I will tell you that an organized union house will give way better service than a disorganized non-union one. They need to post a menu outside. They are probably losing so much business not doing this. I myself passed on the place because I really had no idea what they serve. This is the problem with American’s, always putting the blame on things like the UNION. What does the Union have to do with the fact that the food was terrible? The Chef needs to take responsibility for the low quality of produce, meat and TEA, yes even TEA and Iced tea he served at his restaurant. Just because you are in a fancy hotel does mean you can overcharge for crappy food. Many new restaurants open and want to be different but they are all the same, none of them unique, most of them serving poor quality food and always serving Pepsi drinks. Hello!!! Consumers want to feel good when they leave a restaurant not have to go to a hospital later. People pay for good products, why else would Whole Foods be in business!! Just saying…..